This is pretty exciting. You may not know this, but Halloween is my favorite time of the year. You already know that I love to build projects, and making things is a passion of mine. Well, I have combined the two for this post. I will detail the process of creating a silicone mold to make plaster castings and then finish out the casting with all the accouterments necessary to create a life-sized, 3D model of the Ales of the Dead logo. If you like this kind of tutorial, let me know in the comments below and I will create more Halloween Step-by-Steps (though, they will be on a different page). And yes, it is highly detailed and looks better than the pictures! And of course plaster. I got mine from Wal Mart. Any Plaster of Paris will do. Last, but not least – Waxed paper and the cheapest chip brush you can get from Wal Mart. Grab a handful of these, it’s a one-time use process. The Apoxie Sculpt is a two-part epoxy. Mix them 1:1 in the desired amount. Since it’s a chemical reaction that causes the epoxy to harden, any amount that you mix and don’t use cannot be saved. Placing it into an airtight container won’t change this. I created two silicone molds simultaneously, and most of the mold making process is of the other skull, but the steps all remain the same. The difference is that this skull is made of styrofoam and I wanted to make some modifications. The resin skull is almost ready to go. Where there are holes and passageways through different bones, I used some of the Apoxie Sculpt to plug the holes. The silicone mold won’t release if it goes through the item you’re molding. I shaped the plugs and smoothed them to match the texture of the skull. Since it does have some paint and finish on it, I sprayed it with Clear Coat so it wouldn’t come off onto the mold. As you can see the skull was made to be “missing” teeth. I’ll fix that in a moment. I also covered the skull with joint compound. Once it dried, I sanded it smooth. Then I covered the skull with the first coat of the Mold Maker. You can also see that I have filled in the voids where teeth were supposed to be. I covered the skull with a layer of these strips and added another coat of Mold Maker. The cheesecloth strips add strength to the mold and help is keep its shape. This creates a nice thick mold and should last for at least 50 skulls. Remember to also make three layers of the underside of the skull. The black (bare) spot in the center of the bottom is left without Mold Maker on it. This will be where the plaster is poured into the mold. Once the mold is dry, it’s time to make what is called a Mother Mold. This is made with the Plaster Cloth. Cut these cloths into manageable strips and get a tub of warm water ready. You want to wet the plaster strips and cover HALF of the skull. At the center line, create a raised ledge. This will be used as the separation point once the plaster is cast. Once dry, coat the exposed side of the ridge (facing up in the picture below) with a thin coat of petroleum jelly. This will allow the two halves to separate and not stick to each other. I found out after this project that you can use wet paper towels along this flange to do the same thing. This is a better method and won’t help to deteriorate the mother mold at the application site over time. You don’t have to cover the bottom of the skull, the purpose of the mother mold is to help the silicone mold keep its shape. I created a “bridge” over the seam with more of the plaster fabric. As it was drying, I placed it whole assembly upside down and flattened a portion of this bridge so that the whole mold would sit steady as I poured the plaster into the bottom. Now comes the scary part – removing the silicone mold from the skull. First lightly rub at the edges on the underside until it comes up all around the hole. Then, slowly roll the mold up the back of the skull to the face. Don’t worry, you WON’T tear the mold. That’s why we made it using silicone. Make sure to be extra careful around all the details on the face. Keep rolling it until it comes off. And now it’s inside-out. Go ahead and reverse it. Ta-da! Here they are next to each other. And here’s the pour hole. Go ahead and place it into the mother mold. Mix your plaster to get the consistency you want. Thick, but runny work best for me. Add a little at a time, moving the mold around to coat all the surfaces of the mold. I do this three times to get a nice even, thick cast. Here you can see the full jaw resin cast drying. And roll the mold off the shull. There we have it. The plaster casting of the resin skull. I love the level of detail you are able to achieve using this process. I did these back-to back. It’s a nice, repeatable process. I then used an antiquing technique to start to get the color I wanted. Normally, I wouldn’t have painted at this step, but I didn’t realize that this was going to develop into a sugar skull. I first painted the skull black and then rubbed off the paint with a paper towel. To continue with my mold making and to enhance my skills, I wanted to make something smaller, but detailed. I had purchased a key chain of a Hop Cone a few years ago, but it was made from cheap metal and as soon as I dropped my keys, the loop broke off, no longer holding the cone on the key ring. I cut a hole in cardboard just enough to hold the hop cone upside down and covered it with mold maker. My first attempt did not go well and the mold failed. After looking at it, I decided to spray paint the Hop Cone with Clear Coat and that did the trick. So I tried again and the mold has been working just fine. You can see the fibers from the cheesecloth here. I only used two coats of silicone for this mold. I poured the plaster into the mold and let it harden. Then I removed the Cast and made some more. Notice the one on the right is different. I bent a nail and inserted it into the wet plaster to create a loop so that is could be hung. Same antiquing as I did on the skull using the Iron Black paint. And dry-brushed with light green. The one on the right was painted with light green only over the antiquing, so I could see which I liked better. I definitely like the three-step process a lot better. So once I had these finished, people wanted to know what I was going to do with them. I hadn’t really made them for a purpose other than to practice mold making. As I thought about it, I decided to try something. Well, I would certainly call that a success! Superglue to hold it and paper towels to position the Hop Cones in the eye sockets. I wasn’t totally happy with the way the one on the right looked to I removed it and reset the position. That will be shown in another picture. Once that was done, I decided to do another test. I mixed some of the Apoxie Mold and tried a few different techniques. I found one I liked and used it in this test. I printed out one of my logos at the same height as the skull and used the different elements on the printout for sizing. I placed one on each side and let it cure overnight to see the results. I also did a Hop Cone on each cheek bone. Well, the results are in and they were staggering, so I set out to finish it. Once and element was complete, I removed it with a knife and transferred it to the skull. Now, I need to let it cure and then it’s time to paint! Now, I have to blend the new, sculpted parts into the skull’s look. I started with the antiquing of the new elements. The antiquing does darken up the skull quite a bit, but that’s where the dry-brushing comes in. I used the same process as before and after two coats of dry-brush, the look is spot on. I then used a darker yellow to dry-brush all the wheat elements. I chose the darker of the yellows to keep a muted look. 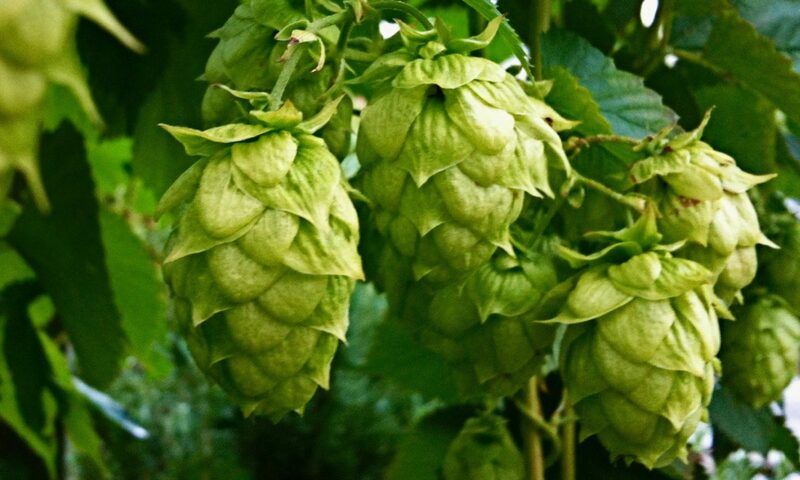 I used light green on the Hop Cones. And there you have it. What started out as powder, water, and putty is now a great representation of my logo. What do you think? Let me know in the comments. Also remember, if you want to see more Halloween Builds, I need to know. Happy Halloween and keep brewing beer!